Leviton QuickPort® 1-Gang 3-port wallplate in grey color, has ABS plastic construction to resist high impacts, chemical solvents and fire. 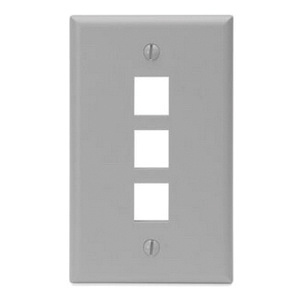 This rectangular wallplate measures 4.53-Inch x 2.77-Inch. It is ideal for use with all QuickPort connectors and adapters. Wallplate is flush mountable in vertical direction. The wallplate meets CSA, UL and ANSI/TIA-568-C.0 standards.